With the recent passage of the Democratic sponsored CRA in the Senate, we continue to see net-neutrality being positioned as an issue for Congress to address. Back in February, AAN commissioned a national survey from The Tarrance Group to help conservative leaders understand the public’s thoughts about net neutrality. Their research found that ensuring ISPs provide a free and open Internet is important, but is only half the problem. Online privacy topped the list of Internet concerns and voters also wanted protections when using search engines and social media. In light of recent privacy and data security breaches, Public Opinion Strategies partnered with David Binder Research to conduct an updated study of the issue. What they found is that privacy is still the top concern for Americans and, by a two-to-one margin, they say Congress should pass new legislation that applies consumer protections to all internet service providers, social media platforms, and search engines instead of just reinstating the Obama FCC’s 2015 net neutrality rules on ISPs. Putting basic internet freedoms and consumer privacy protections into law to ensure all companies follow the same rules and all consumers are equally protected is overwhelmingly popular with voters and is a strong position for conservatives on the net neutrality issue. Attached are the key findings from the recent POS/Binder research. The February research memo from The Tarrance Group can be found here. Public Opinion Strategies and David Binder Research designed and conducted a national telephone survey of N=1,000 registered voters across the United States, including 45% reached by cell phone. Research was commissioned by Broadband for America and conducted from April 14-17. Overall, a 51% majority of Americans reject using the CRA, and voters in Republican and Cook Competitive House Districts are more likely to reject it being used to reinstate Net Neutrality. 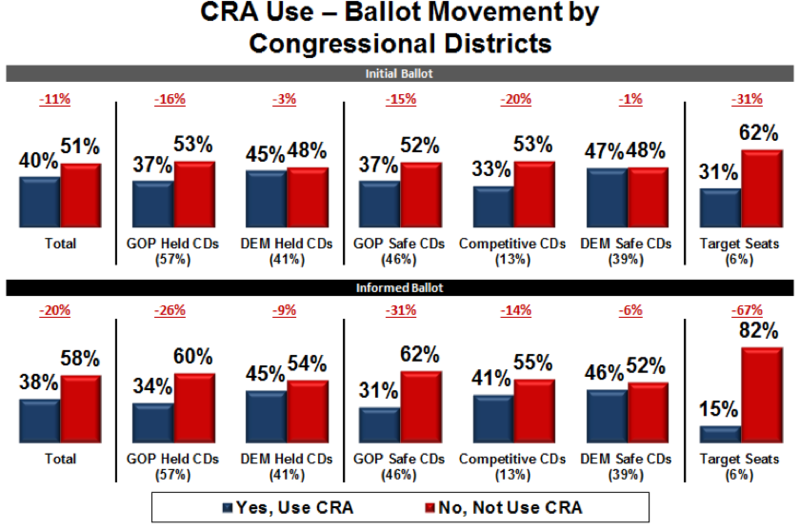 Large majorities in GOP held seats, Cook’s Competitive Districts, and the Target GOP seats reject the use of this CRA. A majority (55%) of respondents familiar with net neutrality are under the misperception that all of the different entities involved in the internet, and not just ISPs, are covered by the rules of net neutrality. Voters in key conservative and competitive districts react positively to a few main messages against this CRA. At least six-in-ten respondents prefer new legislation instead of reinstating Net Neutrality across all voters and across district type. 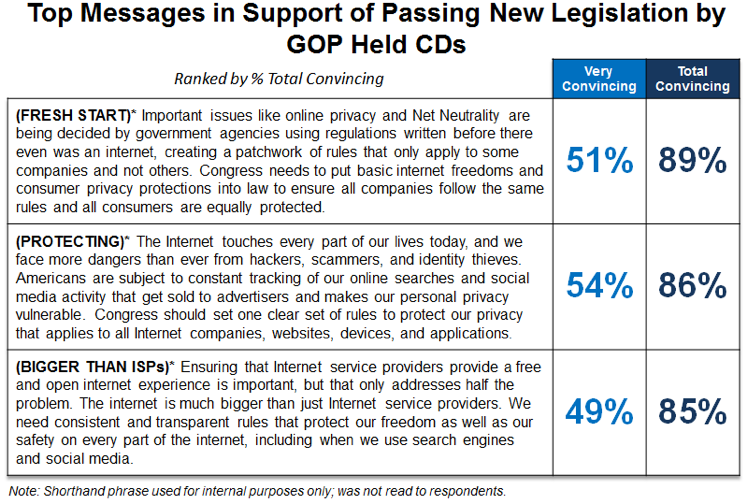 Overall, 62% say Congress should pass consumer legislation that ensures open internet access and creates one set of privacy and data security rules that apply to all internet service providers, social media platforms, and search engines. Only half as many (31%) say Congress should only reinstate the 2015 FCC Net Neutrality regulations that stop internet service providers from blocking or slowing websites and allowing some sites to be given priority over others. Voters in key conservative and competitive districts react positively to a few main messages in support of new legislation. 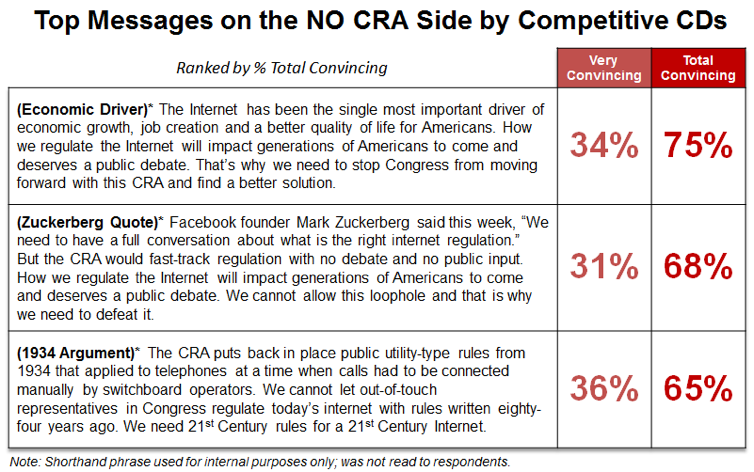 Americans oppose the use of the CRA to impose Net Neutrality. 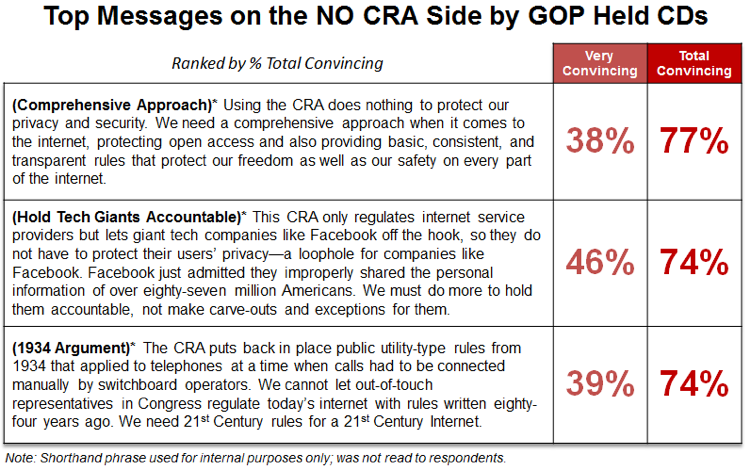 Most reject using this CRA because it prevents needed public input and hearings on the future of internet regulation. This opinion is strongest in conservative seats and very strong in competitive Congressional seats. 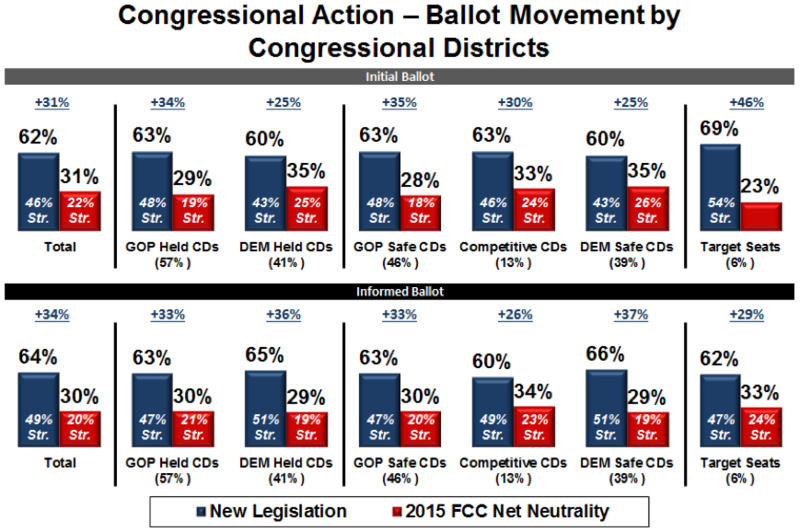 When simply informed that the 2015 Obama FCC rules only apply to ISPs and do not impose online privacy requirements for social media, support for new legislation has the support of at least 60% of voters across Congressional districts, and that support is stronger in conservative seats after hearing messaging from both sides of the issue. The most powerful messages center around finding a legislative approach to the 21st Century Internet that puts basic internet freedoms and consumer privacy protections into law and ensures all companies follow the same rules and all consumers are equally protected.